It was straight into enemy territory on this one! As a lifelong Canucks fan going to Calgary Flames home turf (Saddledome) felt dirty. But the reward for doing so was worth it as I crossed another must see off of my bucket list. I've seen a few shows at the Saddledome and must say out of all the stadiums I've been to the pitch on the seats at the Saddledome is the steepest. You do NOT want to fall down the stairs while going to your seat as you'll fall a long ways down them. ​Anyway - the show by RCHP was awesome. They started with a little jam and then went right into their hit "Can't Stop" and from there it was full out. Their stage was pretty basic but the most unique part of their show was the 10 000 LED lights, hanging by a strand, that would shift to different patterns. That was totally awesome. Solid and really great. Josh Klinghoffer (the newest guy) really did the guitar parts justice and played well. The rest of the band are accomplished vets and make playing look easy. I got to say that the Calgary crowd was awesome and a very mixed batch of ages. RHCP appeals to multiple generations for sure. My second go round seeing Alice Cooper! My first show was him opening for Motley Crue about three years ago. He didn't disappoint then and he didn't this time either. I do believe his secret is surrounding him self with much younger, enthusiastic, players who really amp up the energy to his show. His band includes a pretty solid compliment of players that really bring his music justice. My favourite part of the show was his tribute to fallen artists. It started with Pinball Wizard (The Who), then to Suffragette City (David Bowie), and ended with Ace of Spades (Motorhead) which featured his bass player Chuck Garric on vocals. He did a great job on them too! Was totally awesome again! 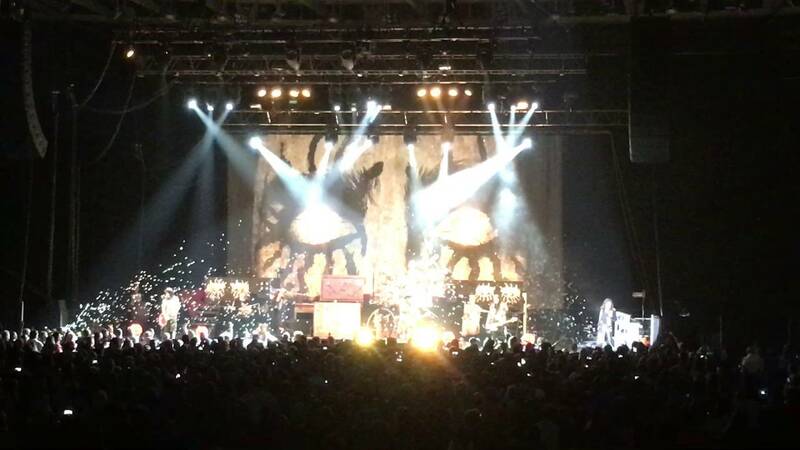 Go and see Alice Cooper before it's too late. His stage show and presence are impeccable. The guy is pushing 70 years old and rocks harder than most bands half his age. Great, high energy, rock crowd that loved the song medley to fallen musical heroes. Another one off the bucket list! This time it was the 80's Brit-Pop Rock superstars Duran Duran. 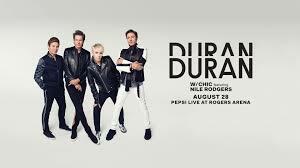 I've always been a fan of Duran Duran they bring rock music to the masses with a bit of a fashion edge. They're one of them bands that is not afraid to take some risks in their music which is why they are so great. Unfortunately, for this tour, due to a family emergency, one of the cornerstones of the band Nick Rhoades (keys) was absent and they had the very capable MDNR (Amanda Warner) fill in for him. She did a GREAT job however for me being a stickler for the originals it would have been nice to see Rhoades on the keys but then again Andy Taylor isn't in the band either so that throws my desire to see an all original Duran Duran out the window. With the death of David Bowie still fresh Duran Duran paid a really nice tribute to him in their set with their song "Planet Earth". They also had a few political overtones regarding the US election too. Good on them for being them and not being afraid to show it. The opening band Chic was really not an opener. The leader of that band, Niles Rodgers, is an absolute legend in the music scene. He brought a great band with him and put on a great show along with Duran Duran on their new song "Pressure Off" which is a new, very catchy song, from Duran Duran featuring Rodgers. What can I say about Duran Duran??? These guys are really seasoned pros they developed their chops coming up through the club scene and are just great in concert. They know how to put on a GREAT show. And let me give a small shout out to their touring band who were FANTASTIC especially Dominic Brown (lead guitar) who is the guy that plays in place of Andy Taylor. What a great, solid, player who really actively engaged the audience. With exception of the missing in action Nick Rhoades there was not much wrong with this show it hit all the right notes. Both bands (Chic & Duran Duran) were outstanding along with their supporting bands. Excellent crowd filled mostly with fun loving soccer mom's there for a good time. 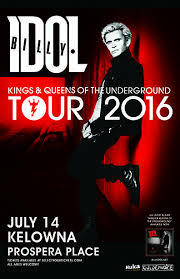 Billy Idol is a MONSTER for a guy his age (in his 60's) he still in peak condition and still puts on an INCREDIBLE show. His backing band was amazing and once again if you ever get a chance to see Steve Stevens live - GO! VIDEO: "SHOCK TO THE SYSTEM"
If you ever get your chance to see these guys perform do yourself a favour and go. You won't be disappointed. WHAT A SHOW and it easily was the best one I saw in 2016. Excellent! Steve Stevens (lead guitar) is the stand out in that band. The rest of the band were awesome in the supporting role and provided awesome backing vocals. Awesome crowd! Great age range however mostly people over 40. One of the last remaining remnants from The Eagles is Don Henley. 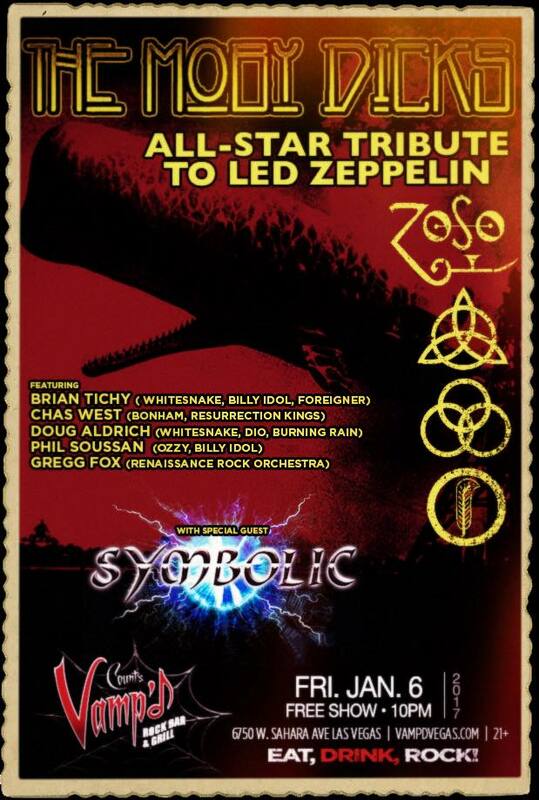 With the passing of Glen Frey earlier this year this show had kind of a somber meaning to me as I continue on my quest to see artists I love before it's too late. Henley who is in his late 60's is a very unique musician. He was a session player for many famous artists before going on to form the hugely popular Eagles with Glen Frey. This was my first chance to see him outside of the Eagles and he didn't disappoint. He played a plethora of songs from other artists, his solo career, from the Eagles, and also a few from his very underappreciated "Cass County" album. 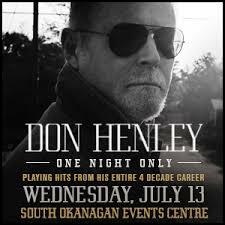 My favourite moment of the night is when Henley and his band played an OUTSTANDING version of Tears for Fears "Everybody Wants to Rule the World". If you want to hear a real folky, soulful, album that showcases Henley's songwriting then I would highly recommend you check out Henley's album "Cass County". This album has flown under the radar and won't get radio airplay due to it not being trendy. It's a solid album of featuring appearances from: Miranda Lambert, Mick Jagger, Merle Haggard, Dolly Parton, and Marina McBride. I will caution you that this is very much a country/folk album but give it a spin and open your mind up to new possibilities. Click the link below to hear a few samples from "Cass County". Outstanding! Very large backing band that provided great backing vocals and musicianship. Some of the band members played with Henley in the Eagles. Great, good times, crowd that got into the show. Diverse age range too! After collapsing shortly before this show we were left wondering if the show would even go on however it did go on and wasn't too bad. 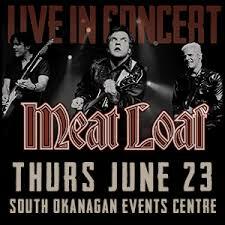 It's was obvious that Meat Loaf could not hit his high notes anymore. Unlike my spouse I give him a LOT of leeway for getting up there at at close to 70 years old and being able to still perform. However, many people at the show were not as forgiving as me and expected a young, 1980's, version of Meat Loaf to show ignoring the fact that father time gets EVERYONE in the end. I will say this... If it wasn't for Meat Loaf's FABULOUS backing band he would have been in big trouble as his vocals were definitely off. His backing band fantastically filled in the blanks and made it seem somewhat of a normal performance. Couple that with the shock of Meat Loaf macking on his back up singer for one song to the shock of some in the crowd and it made for a somewhat entertaining evening! I am also happy that he made it through the show despite collapsing on the stage a few nights before. Great. They backed up Meatloaf very well in his time of need. Great players and vocals. Decent crowd full of young and old alike. I do think they came expecting a young Meatloaf and didn't realize that he's almost 70 years old and the fact that he was able to get up there and perform after collapsing a week ago is incredible. Good old James Taylor is like a guilty pleasure that many people won't admit they like but when no one is looking they are in the corner wolfing his music down. Although I like his music it may have been my first choice in shows. I'll admit going to this show was mostly for the Little Ms but I came away from the show really appreciated his contributions to the music world. Let me say this about James Taylor - what a nice guy! He was SO gracious to his audience and his band almost to a fault. I loved how he told the stories behind many of his songs and infused them with some humour. His voice is SILKY SMOOTH and a real pleasure to listen to. ​I was really pleasantly surprised by the show and the quality of it - even if I was on the younger side of the average age! For a guy that's sold over 100 million albums James Taylor still hasn't forgotten where he came from. Something for everyone to learn from including the many "flavour of the month" artists that permeate the music scene today. Songs done very well! Big props to James Taylor for treating his audience and band with so much respect and courtesy. Laid back crowd so it's hard to give a high rating for energy but it was a GOOD crowd. Definitely on the older side. It sure felt nice to be one of the youngest people in the crowd. The crowd was very in tune with the show. This was not a rock show so it was very quiet in the stadium except for some of his bigger hits like "Fire and Rain". 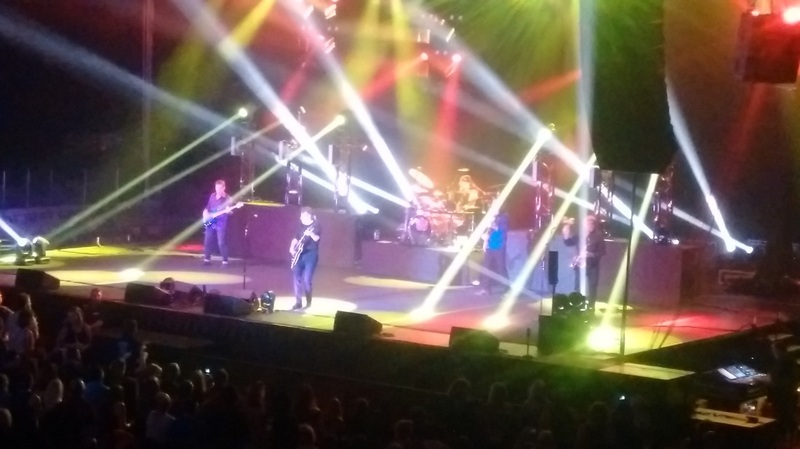 This was my second time watching George Thorogood and must say I thought he was better the first time. Maybe that's just because he (and myself) are getting older. He played all his big classics and the crowd was enjoying the show. It was refreshing to see some younger rock fans in the crowd who also where enjoying the show. I thought that good ol' George show was just a wee bit short on content but for the price of the ticket (about $50) I won't get too fussy. Songs were done well. A couple little glitches in Thorogood's voice however his enthusiasm and ability to get the crowd into the show is great. Pretty good crowd that was into having a good time and really eager to hear the classics. Prospera Place was about 3/4 sold out for this one. I would guesstimate about 3000 people.